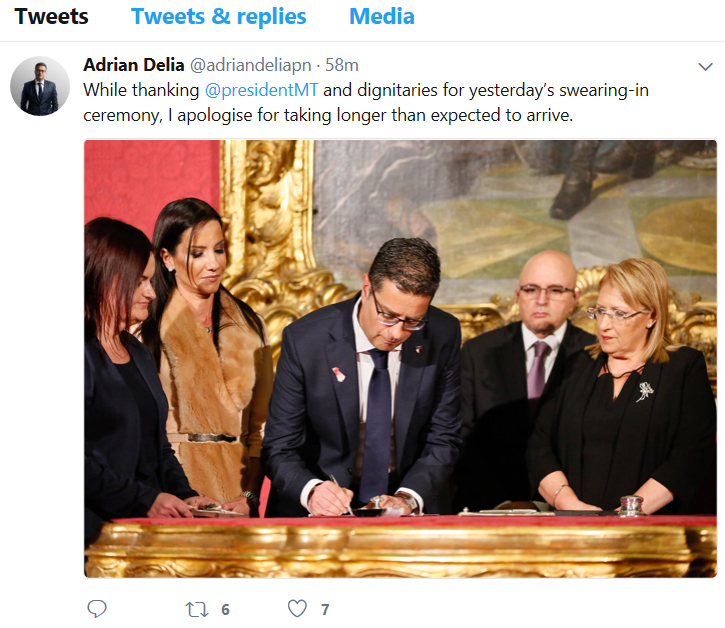 Adrian Delia left Malta’s head of state, the Chief Justice, the Attorney-General and guests waiting when he rolled up more than an hour late for his swearing-in ceremony as leader of the Opposition yesterday. The ceremony was scheduled to start at 5.30pm, which means he should have been there by 5.20pm at the latest. Instead, he rolled up at 6.40pm – an hour and 20 minutes late – with a troupe of children and a fun-fur draped wife. And today, 20 hours later, he tweets this non-apology. I’m beginning to think that beyond being really shady, this man actually has a loose screw. P.S. Will somebody ring Sander Borg Olivier and ask him what he thinks about a man turn up more than an hour late to his official swearing-in as Opposition leader, leaving the head of state, Chief Justice and guests waiting? I’m curious as to what his answer will be, and how long it will take him to work out that if it looks like a duck, walks and quacks like one, it most definitely isn’t an eagle.